As a layman in the pews, I often find myself wondering why the clergy do not preach more often on the symbolic meaning of the rites, gestures, and objects of the liturgy, not to mention the texts (especially the Propers of the Mass — in those fortunate places that utilize the Propers). Since the liturgy is the most obvious common object of perception and meditation for everyone present, it seems both useful and decorous to preach in such a way that the faithful may be led into a deeper understanding of what they are seeing and doing. Admittedly, this could get heavy-handed and risk didactic overload, but at least some of the content of a given liturgy could be brought in — I’m referring here not to the readings, which are what get the lion’s share of attention, but the other elements of the liturgy that take place around the readings, as it were. A sign that this is fair game can be seen in the remarkable amount of patristic and medieval preaching that concerns itself with unpacking the meaning of the liturgy for the faithful. 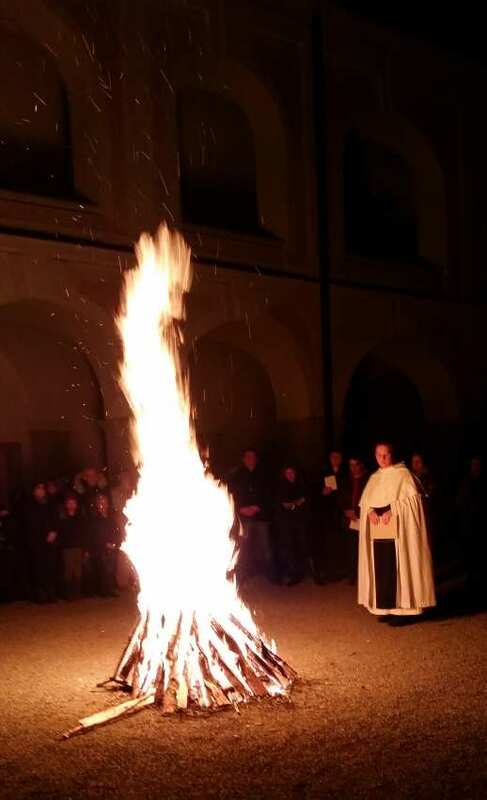 A good opportunity is rapidly approaching: I refer to the great Easter Vigil with its kindling of the new fire and the lighting of the Paschal candle. We have probably all heard some reference in homilies to fire and light, but it seems to get stuck in generalities, which have the effectiveness of clichés. Why not follow in the footsteps of St. Thomas Aquinas and ponder the deep symbolism behind fire — particularly, the reasons why God Himself is compared with fire? In his Scripture commentaries, the Angelic Doctor frequently comments on why God and His action are compared with fire. At Super Isaiam 33, three reasons are given: fire purges, sets other things aflame, and condemns. At Super Hebraeos 12, lec. 5, where fire is said to have, among sensible things, more nobility, more brightness, more activity, more altitude, and more purifying and consuming power. At Super Isaiam 30, five reasons are given for symbolizing charity as fire: it illuminates, boils up or heats [exestuat], turns things towards itself, makes one ready to act, and draws upwards. Super Ieremiam 5 gives five reasons why the word of the Lord is said to be a fire: it illuminates, sets aflame, penetrates, melts, and consumes the disobedient. Take note on those words, and He will be a light to Israel in fire, that our God is called ‘fire’ [for four reasons]. First of all, because it is subtle; and regarding this He is called subtle, [first] as regards substance, for He is called ‘spirit.’ Jn. 4: “God is spirit.” Secondly, as regards knowledge, because He is capable of penetrating. Heb. 4: “The word of the Lord is alive and active, more penetrating than any sword.” Thirdly, as regards appearance, because He is invisible. Job 28: “Whence therefore [is your] wisdom?”, and the same below: “It is hidden from the eyes of all the living.” Or Job 36: “All men [see him, every one beholds from far off],” etc. On this (unofficial) octave day of the feast of St. Thomas, it is good to be reminded again, through such exquisite texts that demonstrate an Augustinian mastery of exegesis and lay out for us a feast of mutually illuminating cross-references, that the Angelic Doctor was, and saw himself as, primarily a commentator on Scripture, a Magister Sacrae Paginae, a teacher of the sacred page. The rest of his eminent intellectual activities flowed from the systematized lectio divina of the schools. This may also suggest a kind of reconciliation between preaching on the lectionary and preaching on the liturgical rites and symbols. In the end, those rites and symbols are themselves rooted in Scripture, and Scripture, in turn, is powerfully illustrated and enacted by them. Expounding the meaning of the liturgy is therefore not opposed to reflecting on the readings but is the essential context for it. Super Isaiam 10 (28:76.330–63): “Nota super illo uerbo Et erit lumen Israel in ignem, quod Deus noster dicitur ignis primo quia subtilis; et quantum ad hoc dicitur subtilis quantum ad substantiam, quia dicitur spiritus, Io. IV «spiritus est Deus»; secundo quantum ad scientiam, quia penetrabilis, Heb. IV «Viuus est sermo Dei et efficax et penetrabilior omni gladio ancipiti»; tertio quantum ad apparentiam, quia inuisibilis, Iob XXVIII «Vnde ergo sapientia?», et infra eodem «Abscondita est ab oculis omnium uiuentium», uel Iob XXXVIII: «Omnes homines». Secundo quia lucidus: quod autem sit lucidus, patet primo quia manifestat quantum ad intellectum, Ps. «In lumine tuo uidebimus lumen»; secundo quia delectat quantum ad affectum, Tob. V «quale gaudium est michi, qui in tenebris sedeo et lumen celi non uideo?»; tertio quia dirigit quantum ad actum, infra LX «Ambulabunt gentes in lumine tuo et reges in splendore ortus tui». Tertio quia calidus: et hoc primo quia uiuificat, Iob XXXIX: «Tu forsitan in puluere calefacies ea?», Tren. I «De excelsis misit ignem in ossibus meis et erudiuit me»; secundo quia purgat, Eccli. XXXVIII «Vapor ignis urit carnes ejus et in calore fornacis concertatur»; tertio quia deuastat, Deut. XXXII «Ignis succensus est in furore meo et ardebit usque ad inferni nouissima».